Rail replacement bus service calling at Poulton station.140 viewsThe fleet of new Blackpool buses have provided a frequent and reliable service between there and Preston but will be gradually withdrawn from 16th April onwards as train services resume. 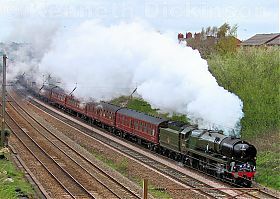 35018 BRITISH INDIA LINE at the head of the Great Britain XI tour (1Z80), with WCRC's 37668 on the rear. 129 views35018 is to be taken off at Crewe and Black Five 45212 will take the train onto Cardiff. New colour light signals now installed at the ends of all six platforms at Blackpool North.134 viewsBanner repeaters are in place on the extra-long island 1 and 2 as the signals themselves are much further along the curved platform. Looking towards the buffers at Blackpool North.130 viewsAll electrification infrastructure is in place ahead of reopening four days later. In the foreground is the new Platform 1 & 2 for Pendolino services. Finishing touches by the ‘Orange Army’ at Blackpool North.122 viewsAll catenary, signalling and new track was in place ahead of the partial reopening on 16th April.